Shot Peened – To stress relieve the outer surface of the Coil, so the Coil can operate under higher fatigue & repeated load conditions to ensure longevity. Scragged for Quality Control -This is a process where the Coil is compressed beyond its yield point; this compression will set-up residual stresses and increase the elastic limit of the spring. Powder Coated – To resist corrosion & to protect the spring steel from minor damage. 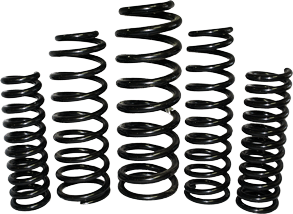 EFS Coil Springs are produced in a variety of raised heights, From standard to 125mm & also a variety of spring rates to suit different applications – Towing, Load bearing accessories, Increased ride height & Competition.